Peak Energy: Natural gas, the green choice ? Natural gas, the green choice ? Chris Vernon at TOD Europe has a post asking what the impact of leaking gas pipelines is on global warming for gas fired power stations - Natural gas, the green choice?. 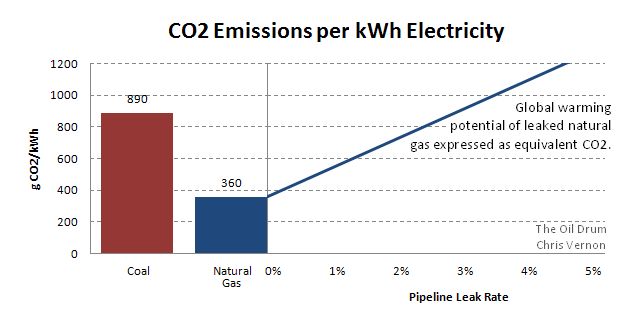 If the natural gas leak rate is 3%, the global warming potential of a kilowatt-hour of electricity from gas is equivalent to coal. So what are pipeline leak rates? A 1997 US Environmental Protection Agency report states US methane leak rates were 1.4 +/- 0.5 % in 1992. The largest source of leakage at that time was compressor components used in the processing, transmission, and storage, followed by the distribution network itself, with the small length of old cast iron pipes leaking disproportionately highly. The natural gas production process also contributes through millions of slowly leaking pneumatic control devices. A larger study carried out from 2005 by Brazil’s largest gas distributer Comgas suggests cast iron pipe leak rates double the EPA study. A 1990 study for Greenpeace considered the UK distribution network then operated by British Gas. Greenpeace estimated low, medium and high scenario leakage rates of 1.9%, 5.3% and 10.8% respectively. This was in contrast to the 1% claimed by British Gas at the time. The authors were confident leakage rates were above 1.9%. These figures are likely obsolete today as there still existed a large amount of pre-1970 cast iron pipe work, much of it since replaced. In 1990 only 39% of the UK mains and 74% of the service pipes were plastic. The 1.4% figure is also old, and only refers to the US, but it is a significant magnitude, it represents a 70% increase in global warming potential compared to the CO2 alone and halves the CO2 advantage gas has over coal based on the 360 and 890 g/kWh figures above. Whilst these figures do not tip gas beyond coal, they halve its advantage. They are also only national. For the US this is quite understandable, but for the UK and Europe, the gas system is changing. Could leak rates become important as natural gas supply routes become longer? As Europe increases its reliance on Russia, as previously stranded gas is brought to market through longer pipelines than before, as a larger number of smaller deposits are exploited and as existing infrastructure ages, it seems likely that leak rates will increase. We often hear about struggles in the former Soviet states related to gas – is the leak rate there one percent or five? Is it economically feasible for the pipeline operator to make investments to stem the last percentage point of a system's leaks? Is it possible that a ‘green’ gas power station in the UK is making a greater contribution to global warming than one burning coal?